A flame within a chalice (a cup with a stem and foot) is a primary symbol of the Unitarian Universalist faith tradition. We kindle a chalice before worship and other gatherings to create a reverent space. 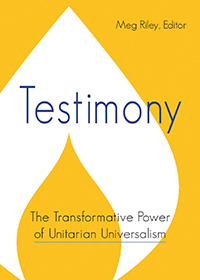 To Unitarian Universalists today, the flaming chalice is a symbol of hope, the sacred, the quest for truth, the warmth of community, the light of reason, and more. At Starr King church, we named our newsletter The Flaming Chalice to honor this symbol. The stained glass in our sanctuary features a flaming chalice against our local California hills. The upper left shows the much loved wisteria vine that still grows on our property, even though the building it once decorated is gone. Upper right is the rainbow symbol that welcomes people of all sexual and gender identifications. Lower left is a symbol showing the connection among all races and ethnicities. Lower right is a traditional church building.